American physician; born at Radnitz, Bohemia, Aug. 17, 1820; died at Albany, N. Y., Dec. 19, 1897; educated at the universities of Prague and Vienna. After graduating from the latter university (M.D. 1846) he was appointed assistant at the Vienna Lying-in Hospital. In 1847 he began to practise in Radnitz, but in the following year, that of the Revolution, emigrated to America, settling in Albany in 1849. There he was appointed on the staff of the Albany hospital, and became a member and later president of the Albany County Medical Society, and senior censor of the State Medical Society. Lewi was one of the forty-two citizens of Albany who organized, in 1863, the Union League in that city. Thirteen of Lewi's fourteen children survived him. The oldest son is the journalist Isidor Lewi (b. Albany May 9, 1850). He was educated at the Albany Academy, became connected with several newspapers, and is at present (1904) an editorial writer on the "New York Tribune" and publisher of the "New Era Illustrated Magazine." 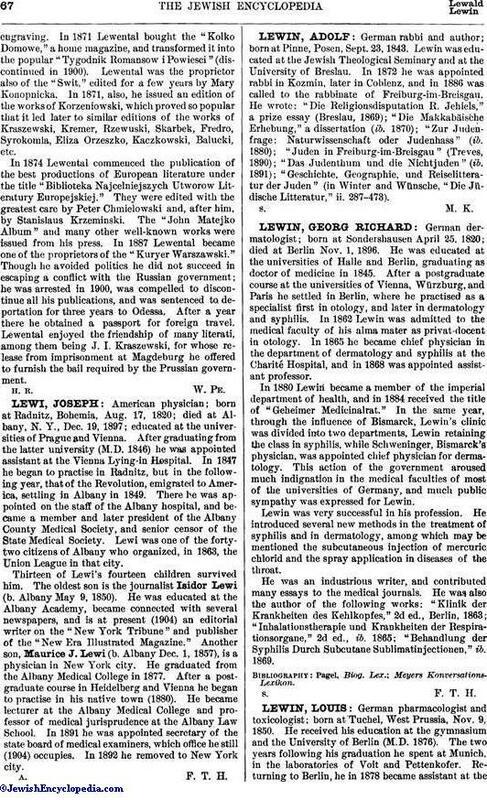 Another son, Maurice J. Lewi (b. Albany Dec. 1, 1857), is a physician in New York city. He graduated from the Albany Medical College in 1877. After a postgraduate course in Heidelberg and Vienna he began to practise in his native town (1880). He became lecturer at the Albany Medical College and professor of medical jurisprudence at the Albany Law School. In 1891 he was appointed secretary of the state board of medical examiners, which office he still (1904) occupies. In 1892 he removed to New York city.